Supporting socket AM3+ and 8-Core CPU, this board is designed to build up the most powerful system and deliver the most demanding technology for advanced users. Just enjoy next generation computing with ASRock 8-Core CPU ready motherboard. 100% Japan-made high-quality Conductive Polymer Capacitors with Digi Power provide buttery smooth, efficient and stable power solution. There's also ASRock's exclusive XFast family including XFast USB, XFast LAN, and the newest member – XFast RAM, which remarkably buffs up the system's performance while extending your HDDs or SDDs lifespan at the same time. 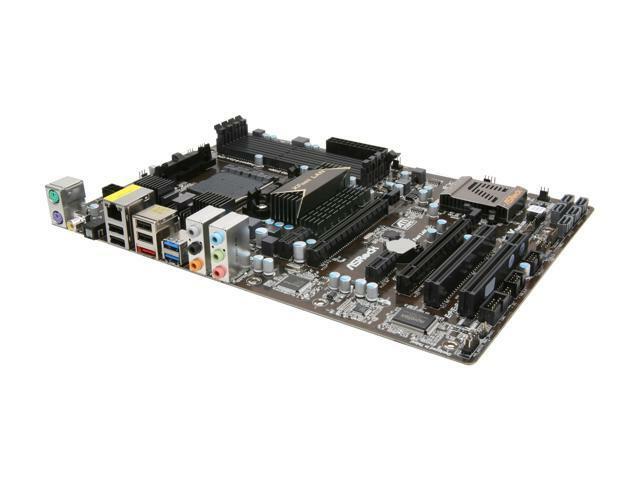 This ASRock AM3+ 970 Motherboard has got just about everything you could wish for build a perfect system around. ASRock XFast USB Technology - Faster Than Your Imagination! ASRock XFast USB Technology redefines the new standard in high performance computing. Proving once again to be the pioneer in motherboard industry, ASRock XFast USB Series Motherboards integrate with the latest XFast USB Technology which delivers the world's fastest USB data transfer speed. The ASRock XFast USB technology can boost USB 3.0 performance up to 5X faster! Digi Power More Precise, More Efficient. By adopting digital pulse-width modulation (PWM), the ASRock motherboard can provide CPU Vcore voltage more efficiently and smoothly. Compared to analog PWM, digital PWM can optimize the CPU power solution and provide a proper and stable Vcore for the processor. Graphical UEFI – The Revolutionary BIOS Interface Unified Extensible Firmware Interface (UEFI) is a revolutionary BIOS utility which offers tweak-friendly options in an advanced viewing interface. Compared with traditional BIOS design, the latest UEFI utility provides lots improved functions. The major features of UEFI include: graphical visual experience, mouse enabling and support for 3TB bootable HDD. AXTU - The All-in-1 Tuning Software ASRock Extreme Tuning Utility (AXTU) is an all-in-one software to fine-tune different features in a user-friendly interface, which includes Hardware Monitor, Fan Control, Overclocking, OC DNA and IES. In Hardware Monitor, it shows the major readings of your system. In Fan Control, it shows the fan speed and temperature for you to adjust. In Overclocking, you are allowed to adjust the CPU frequency, ratio and some voltages for optimal system performance. In OC DNA, you can save your OC settings as a profile and share with your friends. Your friends then can load the OC profile to their own system to get the same OC settings. In IES (Intelligent Energy Saver), the voltage regulator can reduce the number of output phases to improve efficiency when the CPU cores are idle without sacrificing computing performance. Pros: I purchased two units of this motherboard, and had some success with overclocking the FX8120 CPUs to 4100 MHz with the stock fan. BIOS is well organised, and easily upgradable. I've used multiple Asrock motherboards for years and generally trust this brand. People complaining about this motherboard not having integrated video should know that the 970 chipset does not include video, so it's not an Asrock decision, but AMD's. Cons: memory has multiple issue when set to 1866 MHz. Testing sticks one by one shows they work fine, but I wasn't able to make it run with 4 sticks of 4GB RAM, at 1866 MHz each. It runs at 1600 with no trouble, and effect on performance is only imaginary. We sincerely apologize that you having difficulty with memory setting. Please set the XMP setting under BIOS, OC Tweaker, DRAM Configuration, XMP setting [Profile1], save and exit. Check the memory is in mainboard support list to avoid compitable issue. Please visit memory support list at "http://www.asrock.com/mb/AMD/970%20Extreme3/?cat=Memory ". If you have any technical questions please contact us at http://www.asrock.com/support/tsd.asp. We can assist you shortly. Pros: Board is very clean and well labeled . Also very good asset placement on the board. Nice clean looking as well. Asrock customer service is awesome and has crazy fast response times. I was skepticle at first because the board didn't seem to line up properly in my tax mid case but I did finally get it. Other Thoughts: I previously wrote a review on the size and how the board lines up. I want to retract that review. :-). Cons: Extremely flimsy board!!! Does not!! fit the smilidon cases or HAF912 the PCI doesn't line up correctly with case ports. No Video ports so have a GPU ready. Other Thoughts: Decided to try the other brands since I just had to send my MSI gaming board for repairs.... I think I'll stick with MSI or ASUS from here on out. Spend the extra $$ for the quality. We sincerely apologize for any inconvenience this may have caused you. The mainboard’s PCI slots and format are complied with standard specification to meet the market computer cases. Due to CPU and chipset limitation, the integrated graphics is not supported on this mainboard but FM1 or FM2 series as well. As always, we appreciate your purchase and constructive reviews are welcome. If you have any technical questions please contact us at http://www.asrock.com/support/tsd.asp. We can assist you shortly. Comments: I see this has gone up 5 bucks since I bought it. Still very much worth it. There are still alot of am3 boards in inventory that cost lots more and offer way less features. This am3+ board and its bigger brother are very nice boards. Will allow for cpu upgrade later. I don't forsee needing another motherboard until they come out with quad channel memory and pcie3 as standard features. Bought this for my son for his birthday when his am3 board went belly up, also on his birthday......wow. I mean....... really? Happy birthday Mike! Rosewill 92mm hs/fan-copper base and pipes w/ aluminum fins. Works very well. It all went in just fine and booted up and took win7 and performs very nicely.